Montreal taxi drivers protested in the streets this morning, angry over their treatment versus Uber, which recently signed a deal with the Quebec government to start a pilot project in the province. According to CBC News, this morning around 11AM local time, a group of drivers left from Crémazie Street and Pie-IX Boulevard to head downtown, traveling at 10km/h. Their planned route was to head down Highway 40 to the Décarie, then take the Ville-Marie exit to reach downtown. Benoit Jugand, a spokesperson for the Front commun des taxis, says drivers are being treated unfairly and they are “shocked” and “angry.” At this morning’s meeting point, some drivers yelled at police trying to control traffic, while others yelled at each other, as tensions boiled over. The protest plans to block a perimeter bordered by St-Antoine Street, St-Laurent Boulevard, Peel Street and de Maisonneuve Boulevard, ahead of gathering at Dorchester Square. The taxi group says the Quebec government’s deal for Uber to operate as a pilot project for a year, will devalue taxi permits, which cost drivers between $100,000 to $200,000 each. Drivers are upset the deal will create a two-tiered system, not the fact a pilot project is set to start. Taxi drivers sent a letter to the Premier, demanding the government buy back their permits, at values dating to 2014.. The taxi group has already failed twice to get a court injunction to stop the deal between Uber and Quebec. 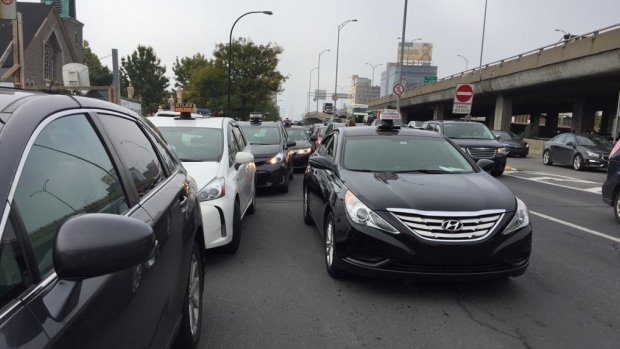 Montreal taxis have held some angry protests against Uber this year. Back in February, cabbies held an “Uber hunt”, setting up blockades, while also egging cars and the ride-sharing company’s offices, and threatening to protest all summer long. The Quebec government’s one-year pilot project will see Uber operate legally in the province, as of October 14. Drivers will collect GST and PST, while also contribute to a fund modernize the taxi industry. They won’t have to rent or purchase traditional taxi permits. Last month, Uber became legal to operate in Ottawa.